Some photos of our booth at the Ottawa Antiques and Vintage Market all set up and waiting for you to drop by for a visit Nov 4th and 5th 2017 at the Carleton University Fieldhouse on Bronson Ave Ottawa Ont. Open 10 am til 5 pm. Check out the antique market facebook page @ http://www.ottawaantiqueandvintagemarket.ca/ to see some of the unique items from the many vendors set up there this weekend. 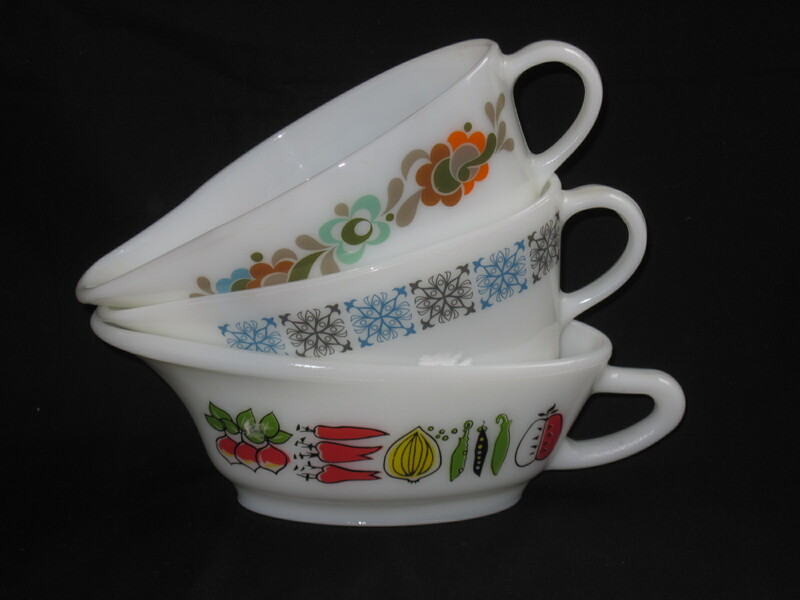 This is a vintage 1950’s set of Pyrex mixing bowls with “Easy Grip” tab handles and pouring spouts. They have raised permanent measure markings which is better than painted ones as they will never fade. The largest of the three is a 2 quart, the second is 1 1/2 pint, and the third is 1 cup. I have seen this set online somewhere in the original packaging which indicated the price then was $1.98 for the set. Obviously a long, long time ago. These bowls are in mint condition and are priced at $65.00 for the set. Hard to come by and even harder to find ones in lovely condition. Pyrex produced these right after they discontinued the opal glass line of bowls. As far as I know, all these colours have been discontinued so we can classify them as vintage now. The bowls have clear bottoms and the colour is on the outside of the clear glass bowls only. The finishes are nice and shiny and the bowls show only mininal wear on the inside. The set will be for sale at my booth at the Almonte Antique Market 26 Mill Street, Almonte ON, just 30 minutes west of the city of Ottawa ON. Open 7 days a week, from 10am to 5pm with plenty of free parking at the rear of the building. Over 50 vendors in a 2 storey brick heritage building offer a huge variety of antiques and collectibles to suit every taste. Priced at $25 for the set. Nice trio of JAJ Crown Pyrex gravy boats from England ca. 1960’s. JAJ stands for James A. Joblings, who was the person who acquired the license to make Pyrex in England from the Corning Co in the 1920’s. The pattern names are from top to bottom: Carnaby Tempo, Chelsea, and Harvest Vegetable. The shapes are different than the American ones and the patterns reflect the tastes of the Bristish customers. I like the colourful retro patterns. These would have originally come with underplates. 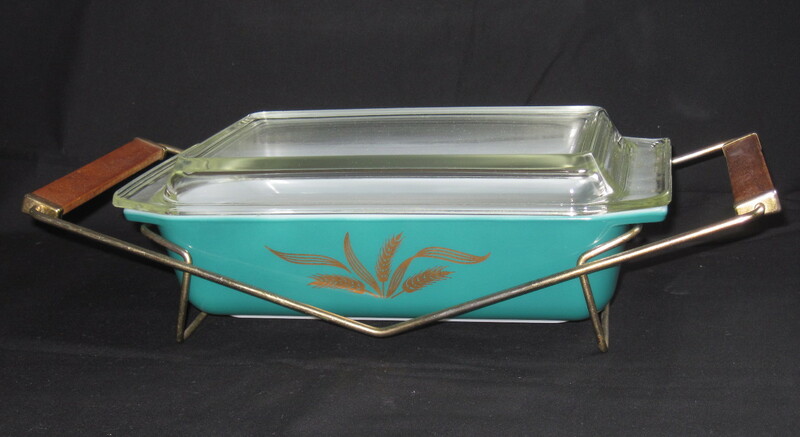 This is another Promotional item from Pyrex, with a pattern of gold coloured wheat sheaves. I checked on Pyrex Love and they have not been able to identify the pattern name yet either. It is the 2 quart rectangular Space Saver size with clear lid. It sits in a gold tone metal cradle/stand with wood handles. This dates to approx. 1960. The dish is in excellent unused condition. Priced at $60 due to its rarity and good condition. Comparables were found on ebay for pricing. Please note I do not ship items. This will be availabe in my booth at the Ottawa Antique Show at the Carleton Univeristy Fieldhouse on Oct 25th and 26th. 2014. 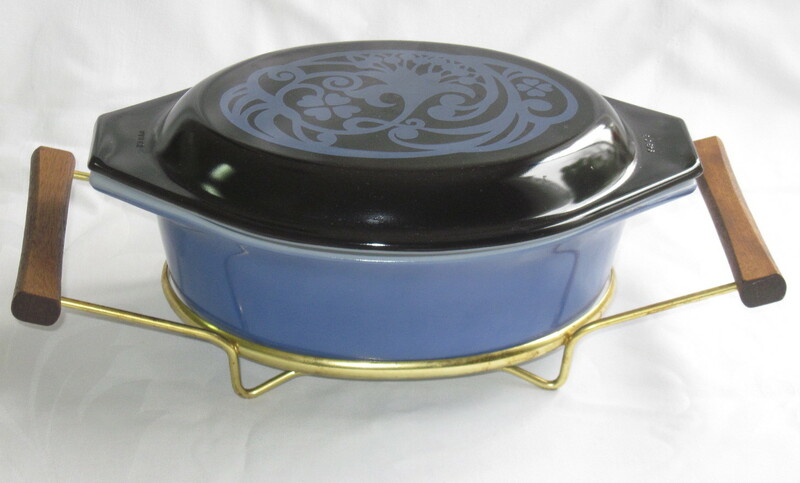 This is a 1.5 quart sized oval casserole dish made by Pyrex, and is probably a promotional piece. I have never seen this one before except on Pyrex Love which is my go-to source for identifying pyrex patterns. 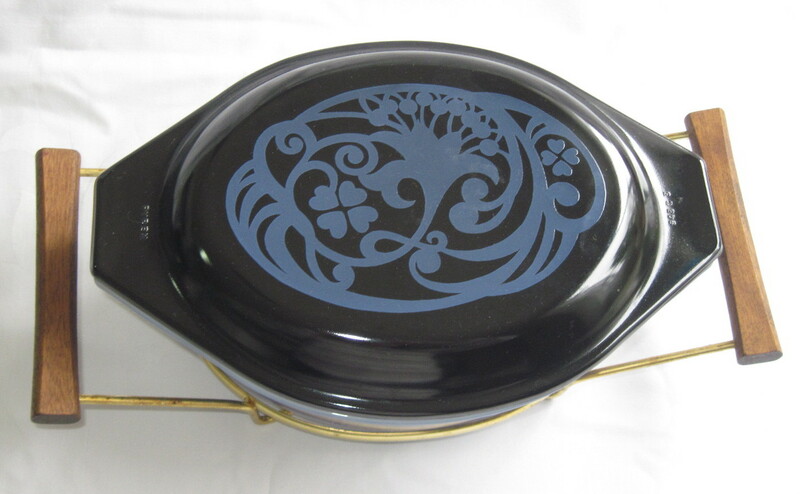 The lid is black with a dark blue Jacobean styled floral pattern on it. The bottom piece is the same dark blue. It is shown here with a cradle/stand made of gold tone metal with wood handles. It is in very good overall condition with no scratches or damage from usage evident. This dish is priced at $45.00. Please note this will be availabe at the Ottawa Antique Show at the Carleton University Field House in Ottawa ON on Oct 25th and 26th. I do not ship items. Thank you. Please note this beauty is now SOLD!!!! Ok, here is a new one on me. I have never seen this pattern before. 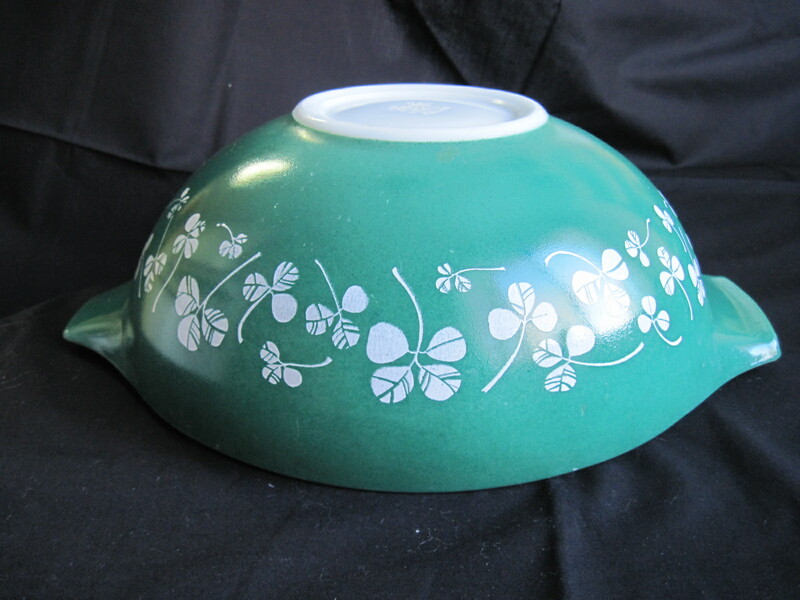 It is made by JAJ Pyrex in England and has white shamrocks/clover leaf pattern. 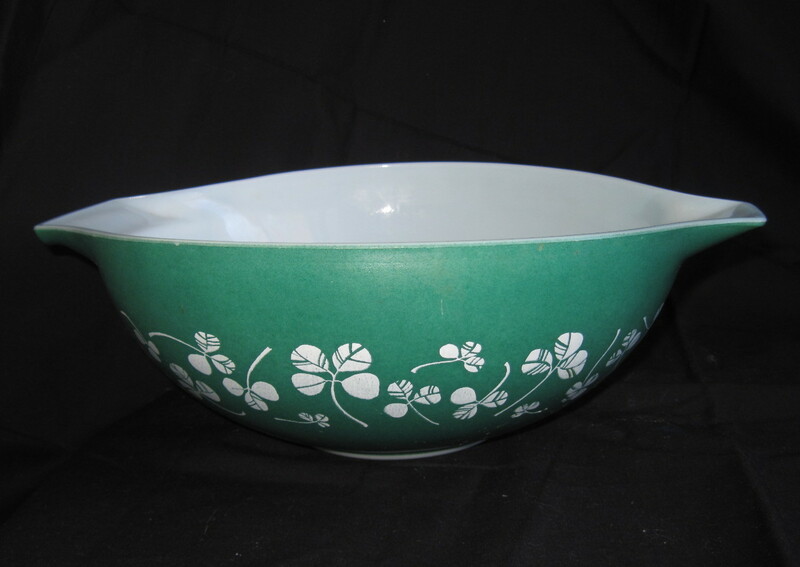 It is part of a chip and dip set that would have included a smaller white opal bowl with green clover leaf pattern. The bowl is in pretty good condition, with some wear to the surface in the way of small scratches in the finish and light wear to the inside. Will be available soon in my booth at the Almonte Antique Market, 26 Mill Street, Almonte ON. Please note: This item is now SOLD! !